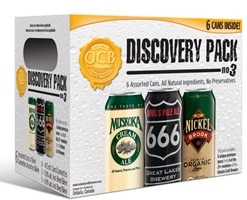 TORONTO, ON – The third edition of the Ontario Craft Brewers Discovery Pack, featuring beers from six different member breweries of the OCB, will be coming soon to LCBO outlets throughout the province. This edition will feature six canned beers, and while the contents haven’t been officially announced, the leaked image seen to the right indicates that Muskoka Cream Ale, Great Lakes Devil’s Pale Ale and Nickel Brook Organic Lager will be three of the six included. The OCB website further notes that Trafalgar Brewery, Wellington Brewery and Neustadt Springs Brewery will be the other three breweries in the package, although it’s not clear which of their beers will be included. Further details will be announced here when they become available. Update – Nov 4th: The OCB have announced that the other three beers in the package will be Trafalgar Paddy’s Irish Red, Neustadt Lager and Wellington County Dark Ale, and that the package will be in stores starting on November 13th. Hey Greg – thanks for the coverage… PR outreach is pending… wanting to time with delivery to stores… so you and your followers will have to wait a few more days to get the final details… we’re sure you won’t be disappointed!